Rendez-vous à The Rocks pour en apprendre davantage sur le passé coloré de Sydney. Votre guide historien vous racontera l'histoire des premiers condamnés à arriver à Sydney, de leurs premières expériences en Australie et de la manière dont ils ont finalement transformé un camp de taudis en un établissement durable. Écoutez les récits de gangs de rue, découvrez le plus vieux cottage de la ville, visitez la douane, et regardez des cartes et des peintures murales de l’ancien et du nouveau Sydney. Max' s passion for the history and characters of the period when convicts where transported to Australia was very evident. Max is an excellent tour guide. A very interesting and informative walk. I loved the "back alleys' and the stories Max was able to tell us about Australian History. I liked the way he threw in a few questions too to keep us thinking. I have bad feet but I found there were enough stops to relax and listen, so I was able to manage this tour just fine. I hear Max has another tour up his sleeve. "Rum and Rascals". I can't wait to hear more from Max about Australia's past. Wish Max had been my history teacher! An informative look into the city's history. Max was a great guide - informative and polite. Open to many questions and responded with clear answers. 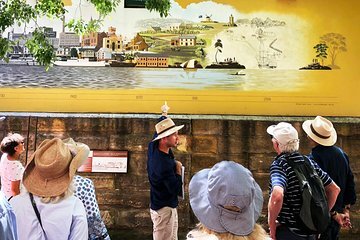 The walking tour was educational, gave us a glimpse into the past of Sydney's discovery by the British, the life's of the convicts and historic buildings. Conducted at a good walking pace with many stops at places you would not find if exploring on your own. I would definitely recommend the tour to anyone wanting to learn more about the early history of The Rocks. This was an amazing tour. The tour guide was very passionate about the history of Sydney and was well versed in giving tours. If you are interested in the beginning history of Sydney this is the tour for you. Max Burns took us on a walk back into the past on our small group tour of The Rocks... his knowledge of the history and his ability to communicate all of it to us in such and enjoyable manner made this tour a wonderful start to our vacation in Australia and NZ...Max made history come alive and we are so happy we were able to spend our first morning with him!!! A truly insightful experience that engaged our small group from start to finish! Our guide was a natural storyteller with an extensive background in Australian history and architecture. We were struck by his ability to weave Aboriginal, convict, colonial and military history into a clear and entertaining narrative through the Rocks and Circular Quay over 2 hours. Would certainly recommend this tour to both visitors and locals! I learnt so much! Having been born in Sydney, I was almost embarrassed about how little of its history I knew! Max our guide was absolutely fantastic. His knowledge and enthusiasm kept us enthralled throughout the two or more hours of the tour. My wife and I were the only Australians on the tour, but I would recommend this tour to anyone, whether your a citizen of Australia or not.